Stand up straight! Why do you always slouch so much! You’re sticking your tummy out! Blah, blah, blah! How many times have we all heard this? Way too many times! But what is the solution? How do we improve our posture? Duct tape a 2 x 4 to our backs? Standing or sitting up straight is hard! It takes a lot of energy. Slouching is easy! It hardly takes any energy at all. Slouching is a bad habit that is hard to break, but it is worth the effort! Habitual slouching causes problems over time… kind of like arthritis. It slowly gets worse and worse until one day, bam! Something happens that finally causes pain and disability… it may be sneezing, coughing, bending over to tie your shoe, lifting, twisting, a thousand different things. But the fact is that habitual slouching has taken its toll. Your body has had enough! When you sit or stand up straight, your muscles are working to support your spine. That takes energy. That takes practice! When your muscles support your spine, your head, shoulders, back and hips are aligned properly, allowing your joints and muscles to function properly and relieve the stress and pain. When you slouch, you relax your muscles and the weight of your body “rests” on the ligaments and joints in a bad way. Slouching over years can cause changes in your spine and joints that you may not be able to overcome. We call it the “Devolution of Man.” Instead of gradually standing and walking erect, we gradually stand and walk stooped over! Place something “odd” on your desk or at your workplace that catches your eye. When you see this “odd” thing, it will remind you to sit or stand-up straight. At SportsCare, we use those old troll dolls with the funky long colored hair. They are hard to ignore! 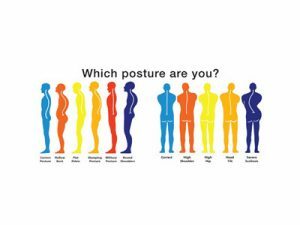 Make a good posture chart or calendar for your family, NOT YOU, to fill-out. Have them place a mark or check on the days or times that they see you sitting or standing with good posture. For every 5, 10 or 20 marks you earn, give yourself a small reward. 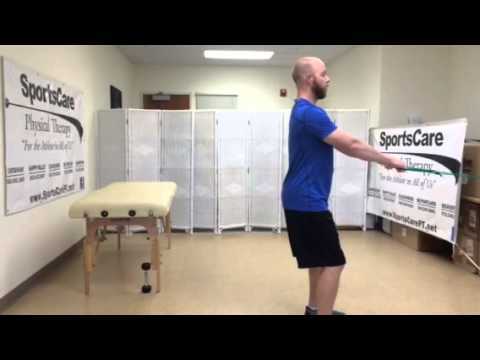 Regular exercise to strengthen your core muscles and reinforce good posture is a must. Place a picture of yourself slouching on your desk or work area as visual feedback of what you look like when you slouch… yuck!! I can’t believe that I do that! Stand next to your teenage son or daughter who is close to your height. I guarantee that you will stand-up straight! Have a friend, co-worker or family member compliment you when they “catch you” in good posture. Negative feedback about poor posture rarely works. Have an ergonomic assessment done of your work station. Or do some research on-line. There’s a ton of good information on desk, chair and monitor placement. Good luck and remember that we all look and feel much better if we sit and stand tall! If you have any questions about posture related injuries, schedule an appointment at one of our four conveniently located clinics!